Forza Horizon 2 will arrive on store shelves at the end of this month (September 30th) so the launch party is starting to get rolling. It kicked off with a bright, shiny, EDM-fueled trailer that just released a few moments ago. The new trailer shows off most of what we can expect from the next Horizon game featuring everything from crazy off roading with Rally Fighters to racing trains with WRX’s. If you avoid blinking you can see a sample of all the cars that will make an appearance in the game but if you want a full list of all 210 cars that will be available at launch hit up the Forza Horizon website. In addition to the trailer Turn 10 Studios also released some information on how the “Forza Rewards” system will work with Forza Horizon 2. Essentially, the “Forza Rewards” program will gift free cars to players who have earned x amount of points just from playing Forza games. According to Turn 10 players started earning Forza Reward points way back in the Forza Motorsport 2 days. Points are earned by playing and/or doing different things in each Forza game. In Forza Motorsport 5 points are rewarded based on how many cars a player owns, how many miles they have driven, etc. The amount of points a player has will determine what “tier” they are in. Nice line up right? Still, there may be some out there who have never played the first Forza Horizon game and might be on the fence about this new one. To those people I would suggest trying out the Forza Horizon 2 demo which comes out for Xbox One on September 16th (next Tuesday). Anyone that is still on the fence after that can check out our full review of Forza Horizon 2 to get our take on it. 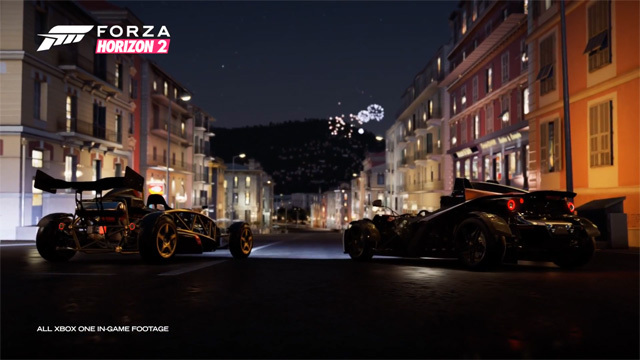 For now check out the new launch trailer below and stay tuned for more Forza Horizon 2 updates! ← Movie Hype: Glorious New OFFICIAL Picture Of New Batmobile Surfaces. It Has Guns.